I absolutely loved listening to this book! At first I didn't think this book was for me. Privileged teens on their family's private island? Make it a TV show, of course i'll watch it, but a book? That is why I decided to go ahead and get the audiobook version. I have heard nothing but good reviews from everyone and I knew there had to be more to this book than what meets the eye. The high star reviews were right, there is definitely more to this book than I originally thought and I am so happy I listened to it. We Were Liars is a character driven book, but it is packed with mystery and beautiful, over exaggerated pain from our main character. I mean over exaggerated in the best way possible. Cadence, our MC, is a privileged teen who is coming to realize what is wrong with her life and family. She is a Sinclair and that means something. "We are Sinclairs. No one is needy. No one is wrong" (Lockhart 1). So, it is fitting that when Cadence describes normal everyday pain, like heartbreak or loss, she uses over the top, dramatic details that make you actually worry about her safety, but she is fine. She is just a Sinclair. One of my favorites is when Cadence says, "The bright red shame of being unloved soaked the grass in front of our house, the bricks of the path, the steps to the porch" (Lockhart 3). There is much more to this scene, but I don't want to spoil it for you. Just know it is one of my favorite scenes in the book, because of all the over exaggerated, heartbreaking details. I also loved that it is a suspenseful YA, because you are constantly trying to figure out what the secret is. Trying to fill in the pieces for yourself before your main character can and We Were Liars doesn't let you figure it out. You find out when Cadence does and it is shocking, heartbreaking, and so terribly good. I really do think I enjoyed it so much, because of the audio. I absolutely loved Ariadne Meyer's voice and really believed that she was Cadence. The performance was authentic and true, and when the ending happens she doesn't hold back showing her own emotions for Cadence's benefit. I do wish that I had a physical copy or even a kindle copy so I could highlight all my favorite quotes, because this book was just filled with literary genius from E. Lockhart. The writing is beautiful and I couldn't have asked for more. I absolutely loved this book. I am so happy I finally decided to grab the audiobook version and listen to it on my way to school, because it had me addicted to listening. The story had me dropping my jaw, laughing, and sobbing. 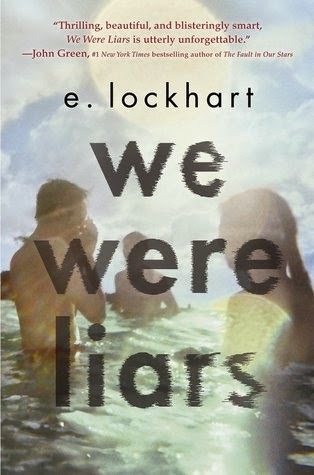 In the end my heart physically hurt and I even tweeted to E. Lockhart saying, "Just finished my audiobook of We Were Liars by @elockhart and needless to say my blood is slowly oozing out of me and puddling on the floor." Lockhart tweeted back thanking me, but I should be the one thanking her. We Were Liars was beautifully painful and beautifully tragic, filled with wonderful, over exaggerated details that I couldn't get enough of. I didn't think this book was for me, but I am so happy I gave it a shot because it was ridiculously good. I highly encourage you to give it a shot and check out the audiobook. I will definitely be re-reading some of my older Lockhart books and looking for more new ones, and I will definitely be looking into more books Ariadne Meyer's has narrated.